Infographics are a popular way to convey a lot of information in easily digestible segments and make it engaging with colorful graphics. 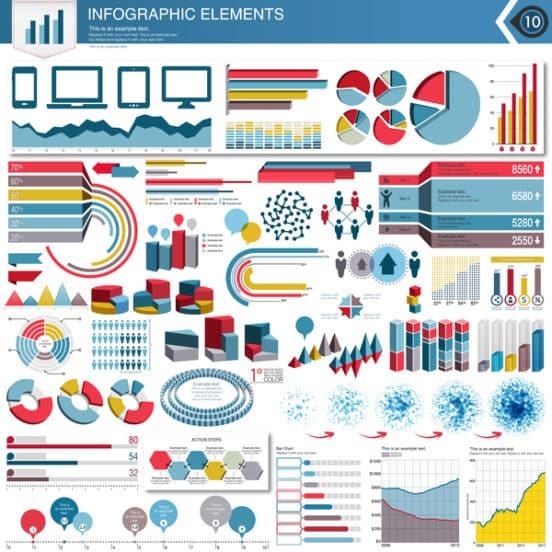 Businesses opt for infographics because they present information quickly and effectively without extraneous clutter or data. 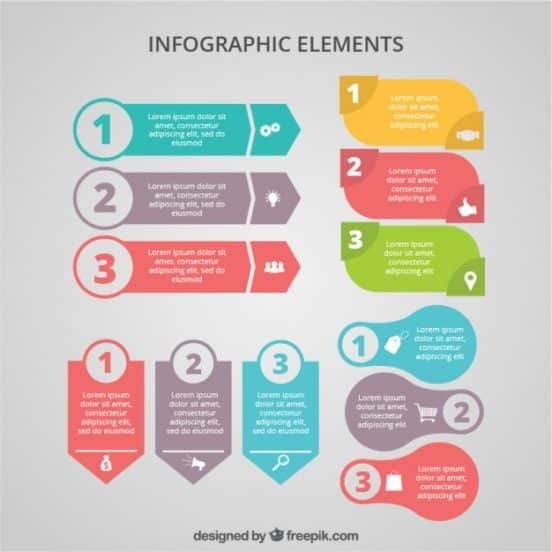 Making an infographic from “scratch” can be time consuming, and if you need to turn out an infographic for your client quick, consider using these free infographic elements to make great shareable designs. Venngage is a free infographic creator that breaks down infographic creation in 3 steps. There’s over 100 templates on the website and you can edit your infographics right in your browser. Free for students, Venngage features a paid plan of $49 a month. Vecteezy features a collection of free vector elements that are perfect for your infographics, including charts, bubbles, icons, and more. Files are editable and can be filled in with your own information. Canva is a popular free online graphic editing suite with premium features. You’ll find a few infographic options packed there, and if you want certain elements, you can purchase them for a few bucks. The templates are varied, with over 20 free options in categories such as Travel, Information, Technology, and Statistics. Easelly says that over 6 million infographics have been created on their website so far, so it’s definitely worth a mention. You can register for free, and pick one of the provided templates. There’s a nice variety of infographic templates here with diverse color and graphic elements, so you shouldn’t get bored. While not explicitly for infographic elements, there’s multiple options available for a free download on Freedesignfile. Topics include Education, Marketing, Manufacturing, Start-Ups, Politics and more — there’s over 200 pages worth, so there’s too much to list, you just need to dive in. Freepik is another great resource for free infographic templates, over 15,000 of them according to their website. With charts, ribbons, tables, icons, and a little bit of everything, you can easily make a graphic you — or your client — will love. The Noun Project is devoted to creating graphics for a world visual language, with over 1 million icons from a global community. If you need an icon, you’ll probably find it here. Sample categories include — but aren’t limited to — food, drink, animals, technology, business, and activities, people, and pop culture. The basic black icons are free, or you can use NounPro, which features royalty-free licenses, custom colors, SVG and PNG files, and apps for popular software. You can also find plenty of icons on Edrawsoft, with call-outs, pie charts, content lists, and more. The selection features various colors with easily recognizable icons similar to those of The Noun Project. Browse through speech bubbles, colored arrows, decoration icons and social media, or even a special Christmas icon set. The file packages (.SVG) are free, and the website also features a software called Infographic Maker. Visme is a simple 3-step infographic maker that features built-in templates. One good feature is it lets you create content libraries if you want to have that information handy for future projects. Offerings include visual stats, maps, tables and icons.